An all-natural, powerful combination of herbs, pure vegetable oils, Vitamins E, A and D and pure beeswax. 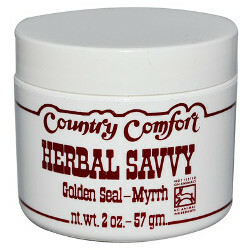 Designed to protect the skin and comfort you while the body performs its healing functions. The properties of goldenseal and myrrh gum powder combine to make a most effective disinfecting ointment for infections, cuts, wounds, hemorrhoids, shingles, psoriasis, eczema, scrapes and any kind of sore. No sunscreens or preservatives added. Ingredients: Safflower oil, sweet almond oil, beeswax, golden seal root, myrrh gum and vitamins E, A, & D.
Each container is 2 ounces.